we need to unify this code. In DOM there is an option to add a "redump", while at this point is better to submit simply "dump", and let DOM scan and define what is a "redump" and what not. I already load gameheader data (size, md5, etc) automatically, but not archive and source data. i think that adding fields directly in the txt will save me the time of loading pages and interface and pushing buttons many times. Will add a new field to ARCHIVE: hidden. Such items will disappear from the public eye. Nothing secret here: simply work in progress data. at the moment nicknames are hidden, will show nicknames of users that agree to this. I will add support to csv import for MEDIA table. But there is no support to 3 or more dump formats. Or to formats with different file structure. 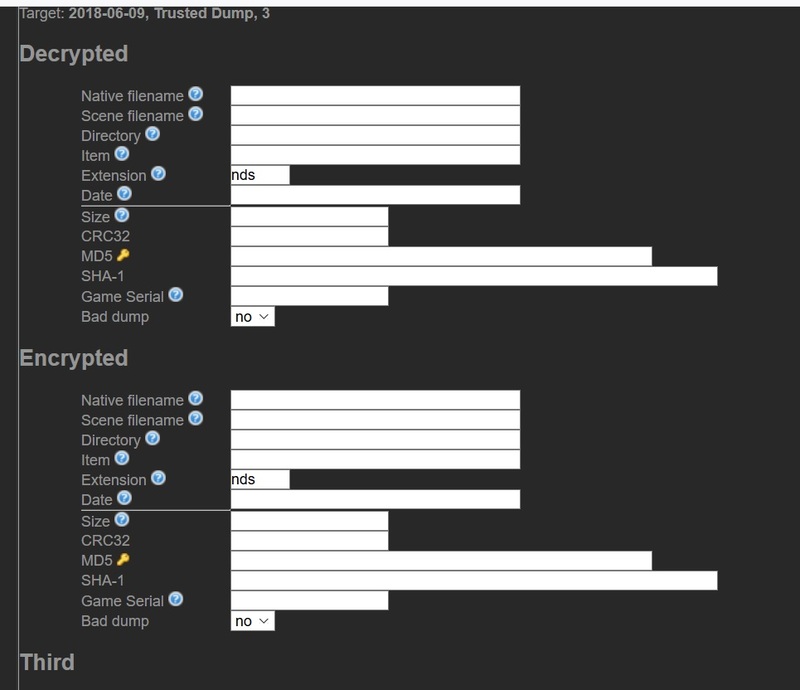 For this reason actually we have 1 NDS set with decrypted/encrypted options and 2 separated PS3 sets. 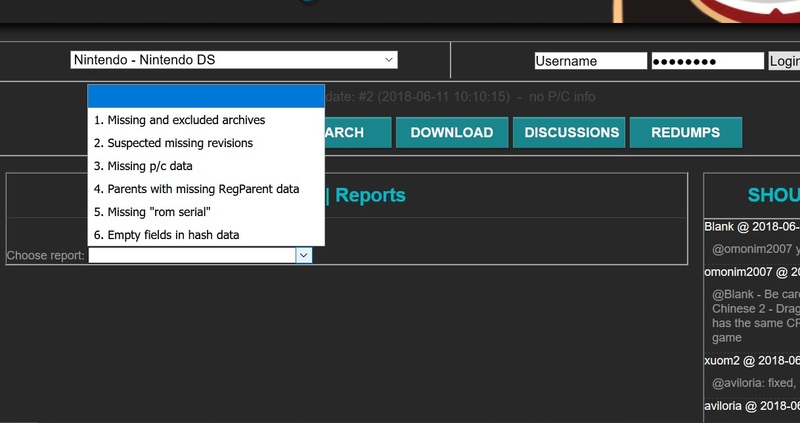 other upload tools (dir2dat and pclone) were moved from ADMIN menu to SUBMIT menu. feel free to check it but BE SURE YOU ARE USING THE ZTEST ROMSET! Created a page for "reports". At the moment only one is available: missing and excluded archives. You can find it under SEARCH / REPORTS. I know you don't care/understand but I see point 7 is really more urgent than expected. It will do deep changes in the structure. I will try to debug as much as possible. Of course data will be automatically converted. At the moment the idea is to not link a file list directly to Source. A "container" should be linked to Source where you only declare the type of dump (encrypted, big endian, etc). Each specific file list will be linked at each container. 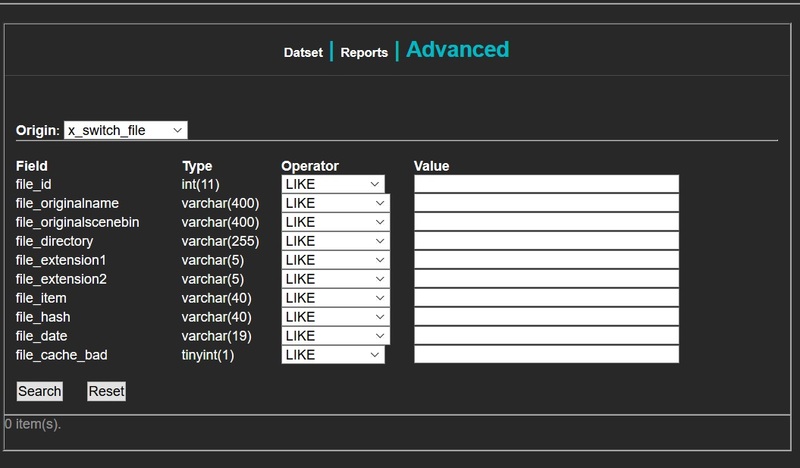 Datsets with only 1 type of rom (99%) will automatically get a container when you submit data. Should be the same for the other (n64, nds). Will do any efforts to avoid confusion. With this move we can merge Sony enc/dec sets, and have more than 2 types of dumps. 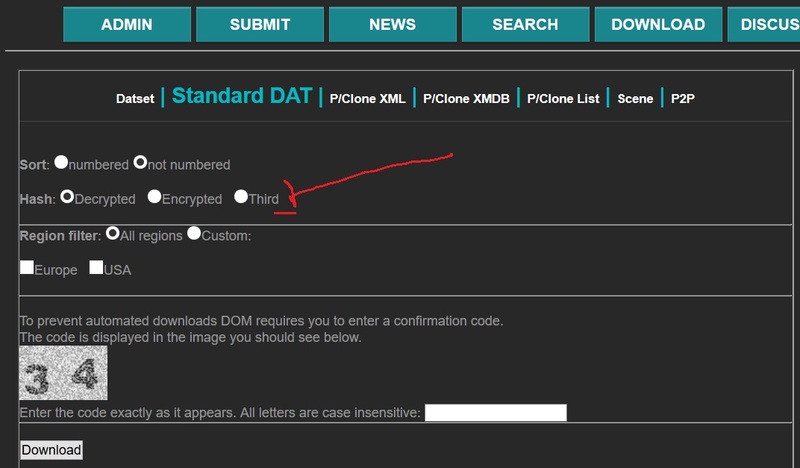 We can have a encrypted set with 1 file and for example the decrypted set with more files. The negative result may be a tiny slowdown of the engine because we are adding a new "layer" to the data. Will do experiments on local machine, and I will upload only when all is ready. For this reason the actual version of DOM won't get bugfixes and changes until I finish this point. Will this make it possible for the SNES set to have a "program ROM" file and zero or more "coprocessor firmware" files as part of the same game? Or the NES set to have separate "program ROM" and "character ROM" files? Exactly. We can have 1 Nes datfile with options to get a "merged" or "splitted" set (or as you want to name them). At the moment it's impossible. At the moment you are limited to store 2 different hashes to the same file (like nds and n64). preview of DOM that will be able to support any number of dump formats, each one with any file format. still testing, hope to upload near the end of this month. Users and datters ask for special reports: I'm moving them all into a single place. While I'm here, do you want the NFO files for Switch to add to DoM ? Maybe an integrated viewer/downloader could be added for NFO ? Add Wii ISO? That's redump's thing . There isn't really any need for a No-Intro Wii dat. You should suggest they add iso.dec to their dat. Are we at the point yet where the SNES set can include co-processor firmware with the games that need it, or is that a thing for later? If it's a later thing, is there anything I can do to help it along? I'm still preparing DOM for the technical upgrade, I hope ready near the end of this month. 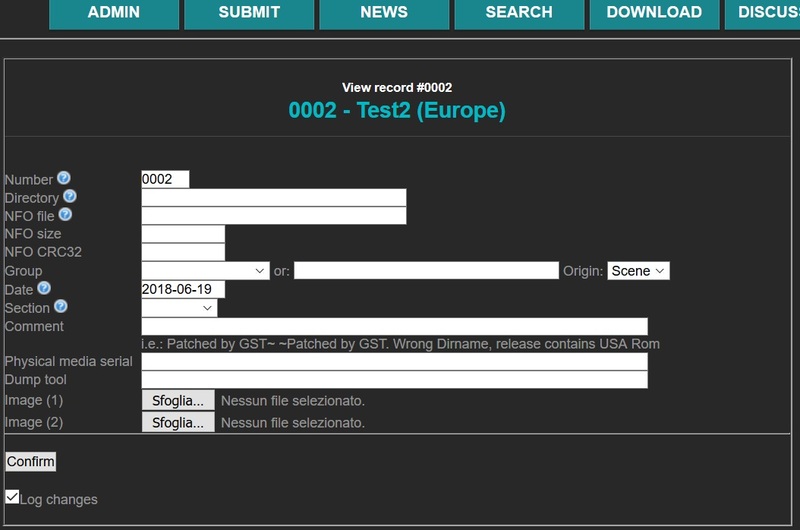 It will be possibile to have any romdata format attached to any source, which means it could be possible to have NES and SNES with "spearate ROM files" or not, NES and FDS "headered" or not, we can merge PSN encrypted with decrypted, add CDN to decrypted datfiles, add 3 hashes to ique and n64, distinguish dump types of PSV, etc. This looks amazing! We will be so high-tech. I love the ideas like headered dats, special coprocessors, fixing PSV. I am excited to work on a merged encrypted+decrypted WiiU set, finish decrypting the rest of PSP PSN and check for bad ones using our clean encrypted sources (as long as the initial merge is done since PSP decrypted is quite substantial) as first orders of business that come to mind. Some sort of import mechanism will need to be worked out since currently even if the names are the same new sets are created on .dat import. Maybe an option to "merge sets with identical names", or even if bulk import is not possible, to bulk import a bunch of files on a per-set basis like I go to the GUI and create a "decrypted" version of the game and copy-paste CMP XML for the 50 files or whatever instead of having to copy individual hashes and filenames for each 000000.app and 0000001.app. We'll see when it gets out.